Circle Prism Chandelier Ceiling Light Pendant. Acrylic prism crystal cut droplets suspended on a polished chrome frame, creating a beautifully shaped round Art Deco style chandelier. With multiple lamp holders for a dazzling lighting effect, this chandelier is sure to add some exuberance to any room. 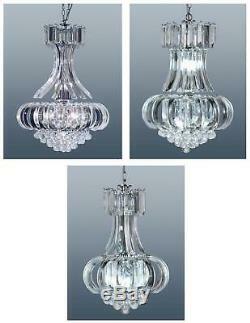 Available in 3 sizes Big 6 Bulb, Medium 5 Bulb and Small 2 Bulb. Big Polished Chrome and Acrylic Crystal Droplet Chandelier 6 Lamp Ceiling Light Pendant 6 lamp holders for 6 bulbs for maximum lighting effect Drop 81cm / 32" Width 58cm / 23" Adjustable Chain 10 - 51cm / 4 - 20 Requires 6 x 60w max SES / 11w Energy Saver bulb (not included). Med Polished Chrome and Acrylic Crystal Droplet Chandelier 5 Lamp Ceiling Light Pendant 5 lamp holders for 5 bulbs for maximum lighting effect Drop 65cm / 26" Width 43cm / 17" Adjustable Chain 10 - 51cm / 4 - 20 Requires 5 x 60w max SES / 11w Energy Saver bulb (not included). Small Polished Chrome and Acrylic Crystal Droplet Chandelier 2 Lamp Ceiling Light Pendant 2 lamp holders for 2 bulbs Drop 58cm / 23" Width 37cm / 15" Adjustable Chain 10 - 51cm / 4 - 20 Requires 2 x 60w max SES / 11w Energy Saver bulb (not included). We are a VAT Registered Limited Company bringing you quality items at excellent prices. Customer service is paramount to us and we want your shopping experience to be a pleasent one. This item is normally delivered within 48 hours (excl Weekends and Bank Holidays). The item "Circle Chandelier Acrylic Prism Ceiling Light Pendant Fitting Large Medium Small" is in sale since Friday, May 11, 2012. This item is in the category "Home, Furniture & DIY\Lighting\Ceiling Lights & Chandeliers". The seller is "homestyleliving-uk" and is located in Weston-super-Mare. This item can be shipped to United Kingdom, Austria, Belgium, Bulgaria, Croatia, Cyprus, Czech republic, Denmark, Estonia, Finland, France, Germany, Greece, Hungary, Ireland, Italy, Latvia, Lithuania, Luxembourg, Malta, Netherlands, Poland, Portugal, Romania, Slovakia, Slovenia, Spain, Sweden, Australia, United States, Canada, Brazil, Japan, New Zealand, China, Israel, Hong Kong, Norway, Indonesia, Malaysia, Mexico, Singapore, South Korea, Switzerland, Taiwan, Thailand, Chile, Antigua and barbuda, Bangladesh, Belize, Bermuda, Bolivia, Barbados, Brunei darussalam, Cayman islands, Dominica, Ecuador, Egypt, Guernsey, Gibraltar, Guadeloupe, Grenada, French guiana, Iceland, Jersey, Jordan, Cambodia, Saint kitts and nevis, Saint lucia, Liechtenstein, Sri lanka, Macao, Monaco, Maldives, Montserrat, Martinique, Nicaragua, Oman, Pakistan, Peru, Paraguay, Reunion, Turks and caicos islands, Aruba, Saudi arabia, South africa, United arab emirates, Ukraine.